HIGH QUALITY MATERIAL: 80% cotton + 20% polyester, very soft & comfortable. 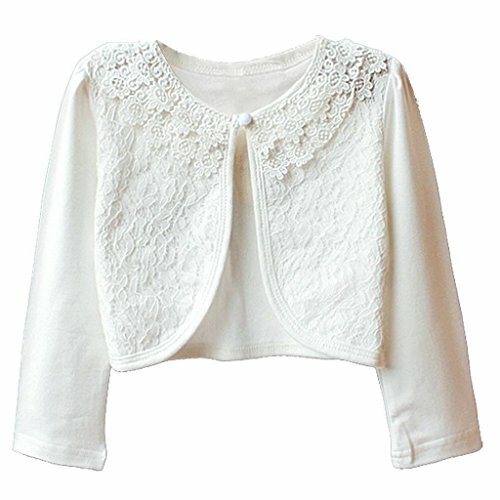 CLASSY AND ELEGANT SWEATER - Delicate lace with hollow flower round collar, button front closure, shows more elegant and beautiful for your little princess. GO WITH DRESSES : It comes in pleasant colors matching any dress. The shrug with 3/4 length sleeves design, covers her shoulders for modesty in a sleeveless dress, can be worn for all season. WIDELY USE: Great suitable for bride, bridesmaid, flower girl, it is also wonderful tool for photography,graduation beach, ceremonyï¼Œcommunions, costume party, bridal party, wedding, church, cocktail party and tea party and so on. If you have any questions about this product by Happy Rose, contact us by completing and submitting the form below. If you are looking for a specif part number, please include it with your message.